Updated Nov 5| Blueberries and hawthorns were some of the native plants members found October 1 along Rocky Valley Trail at Pinnacle Mountain State Park during one of the fall hikes of the Arkansas Native Plant Society. The group also observed oaks, hickories, and numerous other trees and shrubs along the two-mile trail, which passes through a typical Ouachita mixed pine-hardwood forest on mountain slopes east of Pinnacle Mountain and through riparian forest along the Maumelle River. The trail begins at the southeastern corner of the upper (eastern) parking lot at the park visitor center, near a pond formed in an old rock quarry. The pond is extremely acidic, due to leaching from the sandstone rock of the mountain, and a vibrant teal color from blue-green algae, one of the few organisms able to survive in such acidic water. The trail begins as a paved path curving slightly up the hill to the east of the parking lot. At the top of the hill, a gravel path turns to the right (south), following an old road trace. 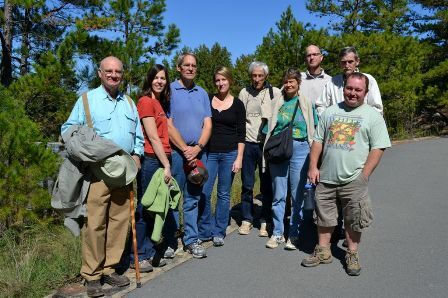 Before continuing along this path, the group took a quick detour up constructed stairs to an overlook platform with a spectacular view of the Arkansas River and river valley, Lake Maumelle, and Pinnacle Mountain. Members examined blackjack oak (Quercus marilandica), a scrubby oak typical of dry, sandstone ridges in the Ouachita Mountains, and other dry, ridge-top trees such as black oak (Q. velutina) and black hickory (Carya texana). Continuing along the Rocky Valley Trail, the group followed the dry ridge top and then turned eastward down a dirt and rock trail and into a northeast-facing slope and valley. Walking through a typical dry, mixed upland Ouachita forest, they saw short-leaf pine (Pinus echinata), black oak; post oak (Quercus stellata); black-gum (Nyssa sylvatica), beginning to show some of its early fall bright red foliage; winged elm (Ulmus alata); and mockernut hickory (Carya alba). Understory trees and shrubs included serviceberry (Amelanchier arborea); parsley hawthorn (Crataegus marshallii), with its characteristically dissected leaves; and American beautyberry (Callicarpa americana), its distinctive clusters of purple berries a vivid sight. The hikers also observed three native blueberry species: high-bush blueberry (Vaccinium virgatum); farkleberry (V. arboreum), the tallest native blueberry, with arching, somewhat gnarled, branches and a dense dome of dark-green, glossy leaves; and low-bush blueberry (V. pallidum), which is Arkansas’s shortest native blueberry at about two feet tall, often forms dense colonies from underground stems, and has very tasty berries that ripen in early summer. Continuing down into the valley on the Rocky Valley Trail, the group found that the forest slowly transitioned to a more moist forest with additional hardwood trees and shrubs such as sweet-gum (Liquidambar styraciflua), white oak (Quercus alba), northern red oak (Q. rubra), red maple (Acer rubrum), and flowering dogwood (Cornus florida). Pasture hawthorn (Crataegus spathulata) displayed spoon-shaped leaves and flaking, camouflage-like bark. Hop-hornbeam (Ostrya virginiana) had characteristic dark, shredding bark and papery fruit clusters resembling hops. At the base of the slope, just above the bank of the Maumelle River, the forest took on a much more riparian character, with Shumard’s oak (Quercus shumardii), water oak (Q. nigra), sugarberry (Celtis laevigata), eastern redbud (Cercis canadensis), sassafras (Sassafras albidum) and understory shrubs of pawpaw (Asimina triloba), possumhaw (Ilex decidua), and rough-leaf dogwood (Cornus drummondii). Musclewood (Carpinus caroliniana), a close relative of hop-hornbeam, had interesting gray, smooth, yet sinewy, trunks reminiscent of rippled muscles. River cane (Arundinaria gigantea), the state’s only native woody grass species, also was present. Although it was late in the year, following a punishingly hot and dry summer, some keen-eyed folks spotted a few flowers during the hike. The group admired the arching branches and yellow flower heads of elm-leaf goldenrod (Solidago ulmifolia), the dark purple flower heads of late purple aster (Symphyotrichum [formerly Aster] patens), the bright white petal-like bracts of flowering spurge (Euphorbia corollata), and the four-petal, yellow flowers of St. Andrew’s-cross (Hypericum hypericoides), a small shrub in the St. John’s-wort family. The Rocky Valley Trail loops back up the visitor center parking lot. Hikers can take an additional one-mile round-trip detour from about the mid-point of the Rocky Valley Trail loop at the base of the valley. This East Quarry Trail spur ascends the steep hill to the east to an old quarry site and another spectacular scenic overlook. Some portions of Rocky Valley Trail are considered easy but others may be difficult. Allow at least two to two and half hours to fully enjoy the Rocky Valley Trail and the scenic overlook spurs. A map and more information about the trail are available here. Editor’s Note: Brent Baker, a botanist with the Arkansas Natural Heritage Commission, led the October 1 Rocky Valley Trail hike. 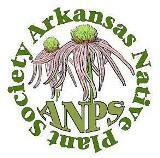 This entry was posted in Field Trips and tagged Arkansas Native Plant Society, Brent Baker, Pinnacle Mountain State Park, Rocky Valley Trail. Bookmark the permalink.